Dr. Hovind has self-published a thrilling new book titled What on Earth is about to happen.. for Heaven’s sake? This book is totally worth adding to your collection! Dr. Kent E. Hovind was born January 15, 1953. 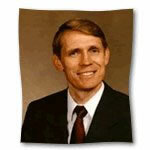 Between 1975 and 1988, Dr. Hovind served as an assistant pastor and teacher. In 1998, Kent Hovind created his Dr. Dino web site and began producing articles and selling video tapes, books, and fossil replicas. In 1971, Dr. Hovind graduated from East Peoria Community High School in East Peoria, Illinois. From 1972 to 1974, Dr. Hovind attended the non-accredited Midwestern Baptist College and received a Bachelor of Religious Education. Dr. Hovind frequently spoke on Creation Science during seminars at private schools and churches, debates, and on radio and television broadcasts. Sadly, since January 2007, Dr. Hovind has been serving a ten-year prison sentence. Prior to his convictions, Dr. Hovind also hosted a daily internet radio talk show and has established Dinosaur Adventure Land in Pensacola, Florida. He is incarcerated at the Federal Correctional Institution at Berlin, New Hampshire. Dr. Hovind maintains his innocence. The vote on Senate Bill 1675 was postponed AGAIN because they want to add one more item to the bill to help cut prison population even more! So THAT’S good! Anyway-looks like a January vote now. I’ll let you know when I find out. I have already served MORE than 66% of my time so I will go home if this passes. This is FUN being on the offense for a change! I’ll keep everyone updated via www.2peter3.com. Thanks for your prayers and support. God will get great glory from all this-just watch! Have a Merry Christmas J Happy New Year J Happy birthday Jo -Jan. 3 J Grandson Jordan Jan 8 J Granddaughter Kailey Jan 13 J me Jan 15 and anyone else who needs one! members of the Judiciary Committee. 202-224-4242 – his secretary indicated that VERMONT citizens should respond. validate that you are their constituent–that really matters to them).